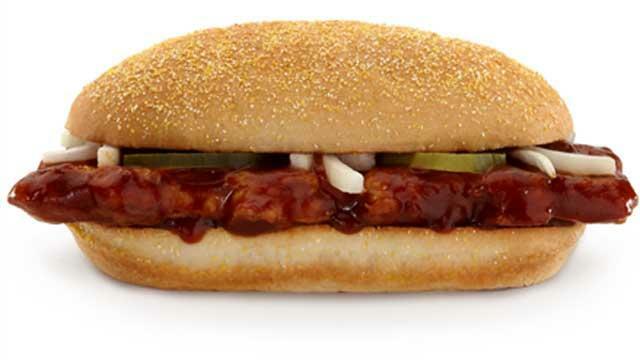 The McDonald's McRib is back, hitting restaurants nationwide today. The legendary boneless pork sandwich, famously molded to resemble a rack of ribs, is both a feat of modern engineering and shrewd marketing. It garners almost as much attention for its pseudo-meat shape as its impermanence on restaurant menus. The barbecue-sauce-smothered sandwich was supposed to return at the end of October, but was pushed back to help boost end-of-the-year sales. 1. The McRib came about because of a shortage of chickens. In a 2009 interview with Maxim, Rene Arend, McDonald's first executive chef and inventor of the Chicken McNugget, explains that the McNugget was so popular when it was first introduced in 1979 that demand quickly outstripped chicken supply. The legendary pork sandwich was developed out of necessity. Franchises that didn't have the Chicken McNugget needed a new hot-selling product — and that's when Arend scrambled back to the test kitchen. 2. The McRib was inspired by Southern BBQ. Rene Arend modeled the McRib after the barbecue-sauce-slathered pork sandwiches he ate during a visit to Charleston, South Carolina. The decorated French-trained chef, who once whipped up fancy culinary creations for the Drake Hotel, is also credited with coming up the unique shape of the sandwich. Although the McRib doesn't contain a single bone, Arend suggested the meat be patterned after a slab of ribs instead of the classic round patty. 3. The McRib is a product of "restructured meat technology." Rene Arend came up with the idea and design of the McRib, but it's a professor from the University of Nebraska named Richard Mandigo who developed the "restructured meat product" that the McRib is actually made of. According to an article from Chicago magazine, which cites a 1995 article by Mandigo, "restructured meat product" contains a mixture of tripe, heart, and scalded stomach, which is then mixed with salt and water to extract proteins from the muscle. The proteins bind all the pork trimmings together so that it can be re-molded into any specific shape — in this case, a fake slab of ribs. 4. The whole process from fresh pork to frozen McRib takes about 45 minutes. Director of McDonald's U.S. supply chain Rob Cannell explained how regular pig gets transformed into the famed McRib in an interview with Maxim: "The McRib is made in large processing plants—lots of stainless steel, a number of production lines, and these long cryogenic freezers. The pork meat is chopped up, then seasoned, then formed into that shape that looks like a rib back. Then we flash-freeze it. 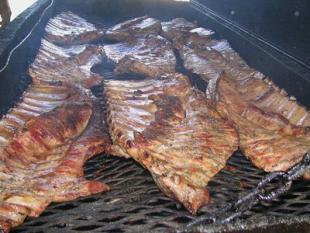 The whole process from fresh pork to frozen McRib takes about 45 minutes." 5. The entire McRib sandwich contains about 70 ingredients — including a flour-bleaching agent used in yoga mats. As it appears out of the box, the McRib sandwich consists of just five basic components: a pork patty, barbecue sauce, pickle slices, onions, and a sesame bun. But, as recently reported by Time magazine, a closer inspection of McDonald's own ingredient list reveals that the pork sandwich contains a total of 70 ingredients. This includes azodicarbonamide, a flour-bleaching agent often used in the production of foamed plastics. The entire sandwich packs a whopping 500 calories, 26 grams of fat, 44 grams of carbs, and 980 milligrams of sodium. 6. The McRib debuted in 1981, disappeared in 1985, and has resurfaced from time-to-time since 1994. Depending on where you read, McDonald's introduced the boneless pork sandwich sometime between 1981 and 1982. The fast-food concoction vanished in 1985, only to reappear as a limited-edition item in 1994. The McRib has become something of a legend for its on-and-off appearances on McDonald's menus. The fleeting nature of the sandwich has generated a cult-like following. 7. Individual restaurants can actually order the ingredients for the McRib at any time. The McRib pops up at McDonald's locations across the country sporadically. It's so random because the individual restaurants are able to offer the McRib whenever they feel like it. The practice has even inspired websites devoted to tracking McRib availability across the nation. 8. 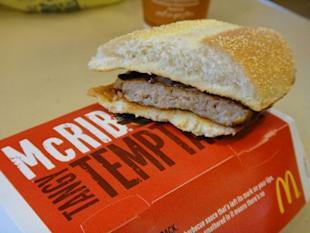 McDonald's keeps the McRib scarce because the sandwich's entire brand relies on it. McDonald's has always known about its customers' weird obsession for the sandwich, and its marketing completely leverages the McRib's scarcity. Take its "Save The McRib" campaign in 2010, where it encouraged McRib fans to go online and sign a petition to keep the sandwich around for a while longer. But a strategy like that only works with something that's as popular as the McRib is. If you make an unknown item scarce, nobody's going to care. 9. It'd be incredibly difficult for McDonald's to create more McRib-esque products, because that cult-like following is so hard to replicate. McRib lovers are fanatical, but it wouldn't be this way if the phenomenon hadn't had decades to marinate in the hearts and minds of its fans. A wholly devoted fanbase for a new product would take years to develop, and even then, there's no guarantee that it would work. McDonald's struck gold with the McRib, and it doesn't want to do anything to affect its brand. Even now, by offering the McRib nationwide twice just a year apart, it's walking a fine line. At what point will consumers get sick of it? 10. There's also speculation that the McRib is really just a big commodity trade by McDonald's. 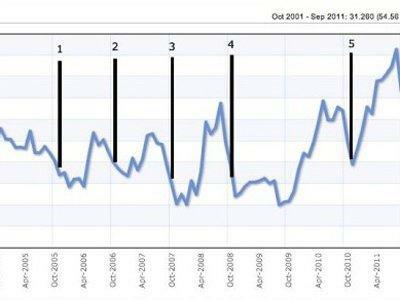 The Awl's Willey Staley argues that whenever the sandwich springs up, hog prices are almost always in a trough. Here's more of his argument on why McDonald's behaves like a trader: "Fast food involves both hideously violent economies of scale and sad, sad end users who volunteer to be taken advantage of. What makes the McRib different from this everyday horror is that a) McDonald’s is huge to the point that it’s more useful to think of it as a company trading in commodities than it is to think of it as a chain of restaurants b) it is made of pork, which makes it a unique product in the QSR world and c) it is only available sometimes, but refuses to go away entirely." 11. Animal rights group sues McRib meat supplier over inhumane treatment of pigs. Not everyone is ecstatic about the return of the McRib. Last November, the Humane Society of the United States filed a lawsuit against Smithfield Foods, the pork supplier of McDonald's McRib meat, claiming the meat distributor houses its pigs in unethical farm conditions. A 2010 undercover investigation by the animal rights group shows pigs crammed into gestation crates covered in blood and baby pigs being tossed into carts like rag dolls (WARNING: the video contains some pretty graphic content).